No, I’m not encouraging you to go bully all the people who may be getting in your way. I’m urging you to embrace your inner anger. Until you get angry enough things aren’t likely going to improve. This isn’t some temper tantrum, kicking and screaming fit. It’s much more quiet – well, it starts out that way. It’s more sober-minded…that just means it’s serious, not infantile. Anger with a purpose. Nothing can replace it. Few things can be as effective as a catalyst for change (i.e. improvement). Here’s how I recently channelled my own anger. I want it to serve to help you identify yours…and figure out ways to make it work to your favor. It certainly wasn’t and isn’t my first bout with anger. Maybe it was elementary school – or even earlier – when I first experienced it. That’s likely true for you, too. “I’ll show you,” is what you said to yourself. Maybe it was after somebody told you that you couldn’t do something. Or maybe it was after repeated failed attempts at something. Sad to say, maybe it was a parent or a coach or a teacher – a person well-intended – who said something discouraging and you bucked up by getting mad about it. Mad enough you were able to direct that energy into some positive movement. Sometimes, positive enough to result in success. That’s the kind of anger I’m talking about. But today, this whole niching down in our marketing begins with the stuff in our head. That’s why this is important and non-traditional marketing conversation. We usually go straight to the tactical. The action steps. The “how to” of marketing. This is much, much deeper. It’s our belief. Our belief in ourselves. We can get in trouble if we try to market – or serve a market – because of what somebody else thinks or feels. Yes, there are some principles of marketing that are effective and others that aren’t. Before we can create an effective plan – real action steps – we have to really know and understand who we are and why we want to serve this market. Not caring isn’t effective. Apathy never fueled anybody’s effective marketing. Passion does. Sometimes that passion is born of anger. Sometimes we don’t make progress until we get mad enough to do something about it. It’s true when we’re 5 or when we’re 75. Anger can be the positive fuel we need to get unstuck. Few things are worse than being stuck, but it’s where many of us spend the majority of our time. Stationary. In one spot. Fearful of moving in any direction. Feeling safer to just stay put. The problem is, success won’t come chase us down. We can’t stand still and expect our situation to improve. So why do many people do that? Because it feels better than taking a chance. Because it feels more comfortable than doing something that makes us feel uncomfortable. We’ll likely choose comfort over discomfort all day long. This isn’t about choosing discomfort though. Just because something is uncomfortable doesn’t mean it’s wise or profitable. Fear. Takes on different forms. It’s directed in multiple directions. My most recent anger was sparked by people and a culture that I knew wasn’t congruent with who I am, or who I most want to be. It’s one of the biggest risks we can face in business — viewing an opportunity without properly considering the downside. Then there’s the fear. For me it was fear that I might not be seeing things as clearly as I felt. It manifested itself in me pushing forward for months, even though everything in me was screaming, “This is so not right for you!” I ignored it as best I could. Day after day I fought through the misery and dread, trying to convince myself that maybe my instincts and intuition were wrong. I’m highly intuitive and rarely has my intuition failed me. But this time I was pushing hard to ignore it because I wanted this endeavor to succeed. All along, I felt like a round peg being pounded into a square hole. I kept working to convince myself that maybe I had edges that were more square than round…even though deep down I knew it wasn’t true. I finally got angry. With myself. For refusing to listen to a lifetime of experience, know-how and accurate intuition. I got mad that I had spent so much time pursuing such a poor opportunity for ME. Mad that I had spent so much time with people who weren’t even close to being the type of people I most enjoy spending time around. Other than a service that I found powerful, there was nothing else about the endeavor I believed in – nothing that was congruent with my personality, my principles or my philosophy. By this time I had invested almost 9 months. That fueled my anger even more. And it wasn’t directed toward anybody or anything other than myself. So I made up my mind that I was going to take a moment – okay, I took more than a moment. I actually took about a week to reach some final resolutions about what I knew was right – what I wanted to do given my new found self-awareness, which was entirely sparked by getting mad enough to do something about my situation. A situation that was entirely my own doing. It was about this time I recorded a podcast episode over at LeaningTowardWisdom.com – a passion project of mine. The episode was entitled, “Don’t Cling To A Mistake Just Because You Spent A Lot Of Time Making It.” I fell prey to this phenomenon. You have, too. We all do it…sometimes. We hang onto a failure because we’ve spent so much time investing in it. It’s hard to pull the plug, even when you know (or feel) it’s never going to work. There’s always that small twinge of doubt in our mind thinking, “What if…?” What if we’re wrong? What if it could work out favorably? It almost never does though. Then there’s all that noise we hear online about not quitting too soon. And hustle. And putting in the work. All good advice, but only if they fit the context of what’s happening with us. If I offer you some pie-in-the-sky business opportunity that is more sales pitch than reality, the sooner you realize the opportunity isn’t very real, the better. Staying with it longer isn’t going to make it more valid. Getting angry with ourselves requires a staunch devotion to our own self-awareness. Accurate self-awareness has to be our non-negotiable. My mistake was trying too hard to negotiate it because I thought the possibility existed that I might fit into that hole shaped very differently than I am. Well, logically I knew it didn’t make sense. I knew I wasn’t shaped right for this opportunity, but I pushed hard to make it fit. I proved that any of us can endure an awful lot of dread and grief. It wasn’t grit or tenacity that I lacked. It was FITNESS. This endeavor was NOT a good fit for me. Why are you negotiating your self-awareness? Why are you negotiating who you are? Or why you do what you do? It’s not the road to success. You may profit financially for a time, but at what cost? What will you negotiate – sacrifice or surrender – to try to be somebody you aren’t? Today, I’m urging you to get mad…mad enough to stop it. Mad enough to get on track to be true to who you are. Mad enough to go all in on your strengths and stop trying to leverage your weaknesses, which we all know is a ridiculous strategy. We can’t operate our businesses by shoving all our chips into the middle of the table on a weak hand. Then stop doing it with your enterprise or career. Or your life. The key is accuracy. We have to really know ourselves. Getting angry at ourselves with a false sense of who we are…that won’t serve us. We’ll just beat ourselves up for failing to be somebody we’re not. Too many people live that life. Don’t join them. Self-awareness isn’t bound up in limiting ourselves. Sometimes I sit with a CEO or business owner who believes the performance of his company tops out at a certain level. Maybe they’ll talk about a revenue amount. They just can’t see the organization performing at a higher level. Maybe it’s a profit level that they just can’t see improving…at least not dramatically. Others find it impossible to see themselves at the helm of a company much larger. All these things can restrict growth and keep companies (and careers) stuck. It’s not intentional. Maybe it’s not even conscious. But it’s effective none the less. A business owner knowingly or not thinks his company is mostly topped out at $12M annually. He can’t see it growing beyond that. His self-awareness is solid and mostly accurate, but he’s got these limiting beliefs that are based mostly on his fears. Fear and self-doubt will work against our accurate self-awareness. In our next episode we’ll close out this series with some things we can learn to hold our ground with ourselves, while simultaneously reaching some new heights we may have thought impossible. And it doesn’t involve being something or somebody other than the best version of ourself. Be angry. Angry enough to think about the market you’re serving and how well you’re doing it. Angry enough to think about how fragmented you may be – and how it’s likely that fragmentation stems from you trying to be something you’re not. Or trying to make your company be something it’s not. Plenty of successful companies have lost their way because they didn’t really know their strengths and they thought it was smarter to broaden their marketing. Meanwhile, some of the best and brightest fully embrace who they are and why they do what they do – and nothing else. What business are you in? Why? What business do you want to be in? Why? 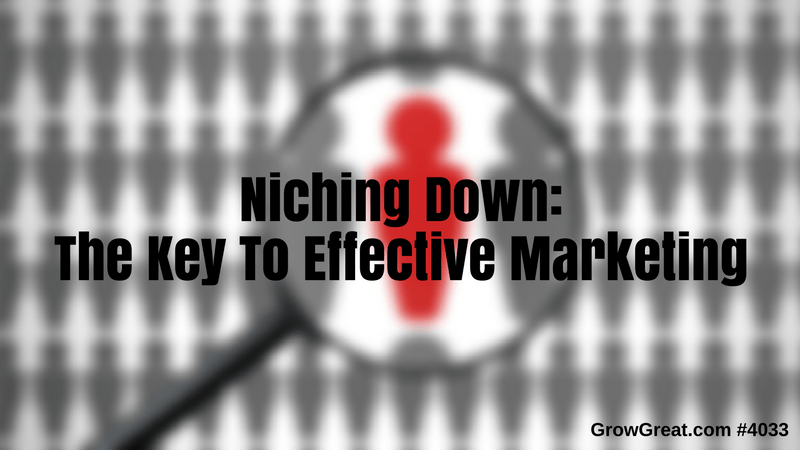 As a leader of your company, your effective niche marketing hinges on what you think. What you believe. Start surrendering that and you’ll quickly lose your way by joining the ranks of the ineffective marketers who don’t know who or what they are. How can the market figure it out? Now you’re seeing the problem. Confusion. Delusion. Sit down and think seriously about what you’re negotiating – the things you really don’t want to negotiate, but for some reason, you are. You’re giving up yourself…probably with a lot of delusions about it working out to your favor. I want you to consider that this may be the very reason you’re struggling. You’re trying to leverage your weaknesses instead of your strengths. Does that sound like a good plan? You know it doesn’t. Let’s talk more about that next time.